Participants in the November 1 Idaho Flood the System Training in Boise requested another, bigger, and better workshop, so Wild Idaho Rising Tide (WIRT) and allies are hosting the Idaho Flood the System Trainings 2. Please join us between 12 noon and 3 pm on Sunday, November 15, to learn non-violent direct action skills and to plan Idaho gasland protests. Converge in the Gates Room of the main, downtown Boise Public Library, 715 South Capitol Boulevard in Boise, Idaho. The following revision of the original event announcement further describes this workshop and previous, similar trainings. Thanks! #FloodtheSystem is a callout this fall to flood, blockade, occupy, and shut down the systems that jeopardize our future. Initiated by Rising Tide North America, #FloodtheSystem is creating opportunities for massive economic and political interventions, long-term coalition and relationship formation, and expansion of popular power along the intersections of race, class, gender, and ability. Learn about Flood the System through links to a graphic narrative presentation and other informative material at the Flood the System website. These crucial, Idaho and Washington, three- to four-hour, non-violent direct action workshops will cover knowing your rights, organizing, scouting, and staging actions, reaching out to the public and media, and any other specific skills that benefit the confidence and capacity of co-hosting communities. At the Moscow session, attorney Dana Johnson, a Civil Liberties Defense Center board member and megaload activist defender, will provide a know-your-rights training. 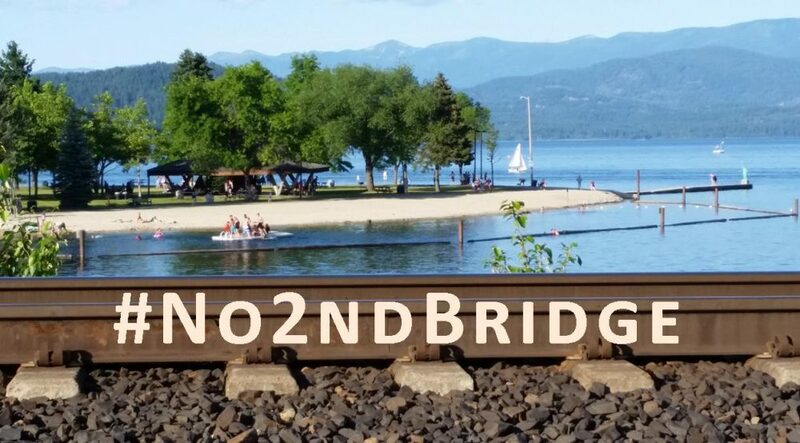 At the Coeur d’Alene workshop, SVCRC director Barbara Miller will discuss laws protecting the human, civil, and environmental rights, education, and expression of all citizens, especially economically and socially disenfranchised rural Americans harmed by corporate invasions. And at all five workshops, local organizers will offer issue updates and options for involvement. Trainers will encourage participant input, suggestions, and questions and coordination of affinity groups and regional action councils to plan and prepare demonstrations. Core WIRT activists and comrades are bringing these empowering training programs to usually overlooked, under-represented, and often impoverished and persecuted grassroots activists and frontline communities enduring repressive conditions in Idaho and eastern Washington. As they relentlessly confront the powerful special interests and resource extraction and transportation industries that perpetuate rampant injustice, pollution, and global climate chaos, these genuine and committed collectives do not have access to large resources or numbers of nearby, relatively insulated participants for staging direct actions like urban activists do. We believe that these workshops will insert some hope, passion, and action into the regional climate movement and associated human and environmental rights causes. Reliant on the people at the bottom of the American economic hierarchy to raise as much hell as possible, we appreciate their determined resistance, persistence, and cooperation in speaking out on behalf of their justified concerns and impacted communities. Please RSVP your workshop intentions by replying via email, registering at the Idaho Flood the System Trainings 2 facebook page, and contacting WIRT or Rising Tide (training@floodthesystem.net) with any questions about this project, these trainings, or travel carpools. Visit the website and facebook pages of workshop partners SVCRC, PESC, Nimiipuu Protecting the Environment, and WIRT, for issue information. 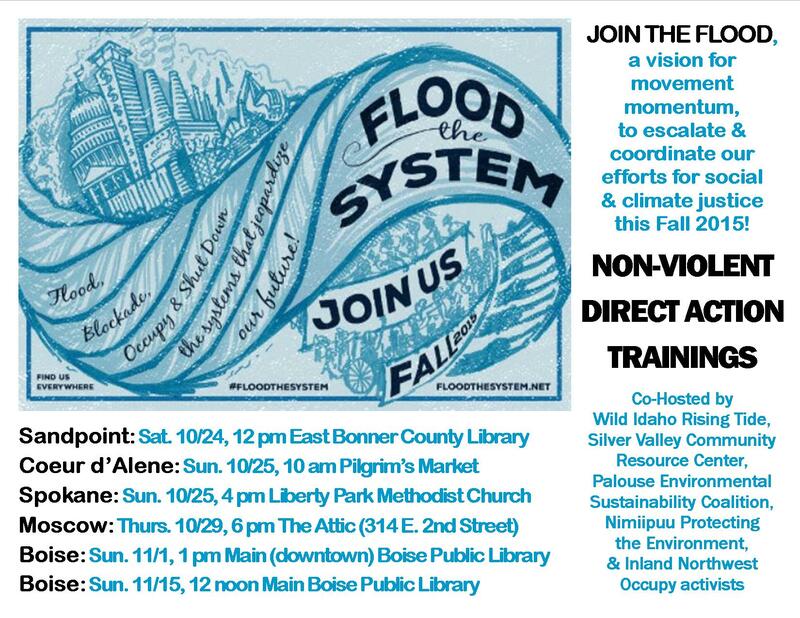 Forward this message, widely share these events on social media, and profusely print and post the color, letter-sized Idaho Flood the System Trainings 2 Flyer among family, friends, co-workers, and trusted allies who may wish to attend or co-lead these workshops. Please contribute your support to this activist work that enhances the non-violent direct action skills of sacrifice zone residents, by donating through this EverButton link or the enclosed contact information. With heartfelt thanks to each of you, as we gratefully and enthusiastically anticipate your participation in these gatherings!